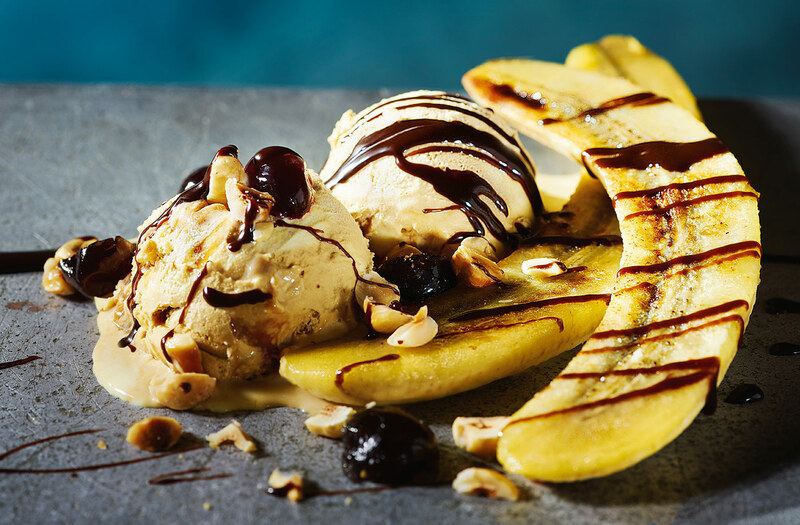 Hot chocolate sauce, buttery bananas, crunchy hazelnuts and smooth ice cream make this the ultimate banana split. What's more, this indulgent pud comes together in just 10 minutes - perfect for when you're craving a quick sweet treat. Melt the butter in a large frying pan over a medium heat until foaming. Add the bananas and cook gently for 2–3 mins each side until lightly golden. Turn carefully with a palette knife to avoid breaking. Divide the banana halves between 2 plates or bowls. Place the scoops of ice cream between or alongside the bananas, drizzle with the chocolate sauce and scatter over the cherries and toasted hazelnuts. Serve immediately. Tip: Cut the bananas before peeling them to avoid squashing the flesh.